What do Omaha, Anacortes, Asheville, and Unalaska all have in common? Besides all being towns in the United States (and starting with vowels), they each have sister cities. Officially, the sister city tradition in the US goes back to 1956, with the Eisenhower-founded Sister Cities International—since then, despite cold and hot wars all over the world, US local communities have managed to befriend other local communities in nearly every country in the world, creating over 2500 partnerships. 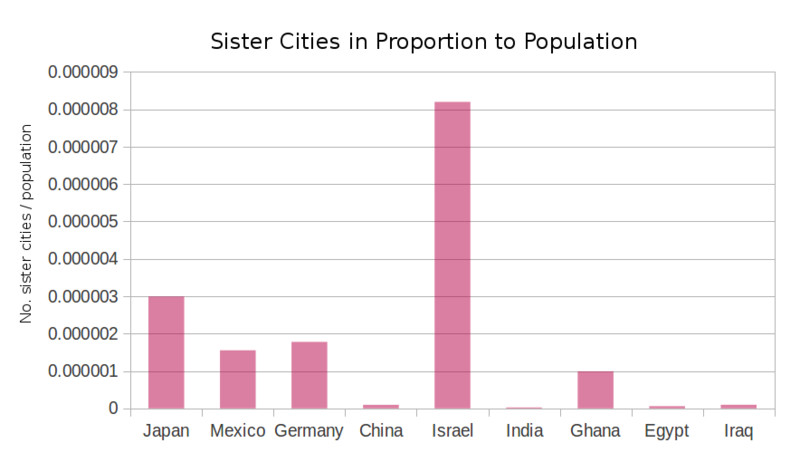 The sheer number of sisters is an indicator of the size and reach of the US, even on such a local level. A cynic might look at town twinning as opportunistic, even colonialist, but it undoubtedly points to our willingness to symbolically cross borders, whether for economic or cultural reasons. The number of pairings also leaves a substantial trail of historical data, and by taking a birds-eye view of all the relationships, we may find patterns, interesting outliers, and blind spots in who our local communities connect with. Outside of the US, the sister city movement is also known as town twinning, and (like more or less everything) has a much longer history, dating back to 836 with an attempt to patch up rocky relations in the Carolingian Empire. The modern sister-city phenomenon begins under similar circumstances; in one of the most notable sister-city pairings, the city of Coventry (UK) paired with Volgograd (then Stalingrad) in 1944, as a message of solidarity with the allied Red Army. In the aftermath of World War II, town twinning was an effective way to generate ties between geographically remote cities, and was promoted as part of a pan-European project of mutual understanding and economic reconstruction. In 1959 Coventry paired again , this time with Dresden, Germany, as a signal of reconciliation between once opposed populations. Other towns become sisters for more lighthearted reasons, like the dozens of US cities that share a name with their twin (though the ‘sister’ analogy breaks down here). These towns often share direct lineages as well, like Glandorf, Ohio (pop. 1000), originally founded by seven men from Glandorf, Lower Saxony . The earliest available US sister city relationships follow similar patterns: first 1845 between New Glarus, Wisconsin and Glarus, Switzerland , followed by Toledos in Ohio and Spain 90 years later. There are a variety of reasons for towns to pair up—name lineage, cultural heritage, commercial partnership—but historically speaking, none of these reasons strongly favored cities in developing countries. Even if town twinning is mostly a symbolic gesture, it carries uniquely local weight, bypassing national barriers to find shared connections through industry or immigration. Based around the idea of citizen diplomacy, it requires active engagement by members of both communities, often including international travel and other educational and cultural exchanges. So how are local governments doing at connecting to lower-income cities and countries? Looking at the global distribution of sister cities (both on the centerpiece map and the interactive globe), we can see a few major clusters. Western Europe, Japan, Israel, and Central America have the most connections, and a closer look at these reveals some other details; for instance, while Germany and France enjoy dozens of town twins, Spain and Portugal are relatively sparse. More tellingly, surrounding Israel is nearly nothing. Two out of every three sister relationships in the Middle East and North Africa are with Israel alone; it is the most overrepresented sister country per capita, and the remainder of the Middle East is one of many glaring gaps in the map. South America and much of Africa (with the notable exception of Ghana—among others, Kumasi is twinned with Atlanta, Winston-Salem, Newark, Charlotte, and Columbus, all major economic centers of their respective regions) join in the overlooked regions. Geography plays a role here, and many of these areas may be missing sister cities due to sparse population (we can identify empty swaths like Brazil’s jungles, Mongolia’s arid plateau, or Australia’s Outback). This is one limit of geographic representation; it is representing area, but not people. It need not be that sister cities are evenly distributed everywhere, but they ought to be representing as many types of people as possible. A look at countries’ demographic information, like population and GDP, can help to offset this limitation. Comparing the distribution of sister cities to electricity usage at night —one possible indicator of economic development—we see that the two do not quite track together. For instance, Saudi Arabia and Oman appear relatively developed, but have no sister city connections (despite the latter’s longstanding political ties to the United States). Both countries also have sisterhoods on other continents, so it is not that the concept of sister cities is absent from these locations; instead, it may be a combination of political and social forces that result in some of these gaps. One of the most notable blips in the figures is the preponderance of Japanese twins; in fact, they have double the number of sister relationships as any other country. What leads to this phenomenon? Japan is most frequently paired with the West Coast and Hawaii, which could be because of its geographic proximity and immigration patterns. On the other hand, the upper Midwest also maintains a number of Japanese relationships, most likely a sign of the Japanese auto industry and its manufacturers in Michigan, Wisconsin and Minnesota (Detroit, for instance, is paired with Toyota in Japan , as well as FIAT’s home Turin, Italy ). Many of these relationships were forged in the 1950s and 60s, with a second wave during Japan’s boom years in the late 80s and early 90s. Given the limited date information we were able to collect, this period appears to be a heyday of the sister city, and might explain the relatively sparse presence of China next to Japan on the map. China and India are highly underrepresented in terms of connections per capita. The importance of these countries on the world stage, which is in part about their economic growth rather than absolute GDP, tracks their sister-city representation better than their population does. 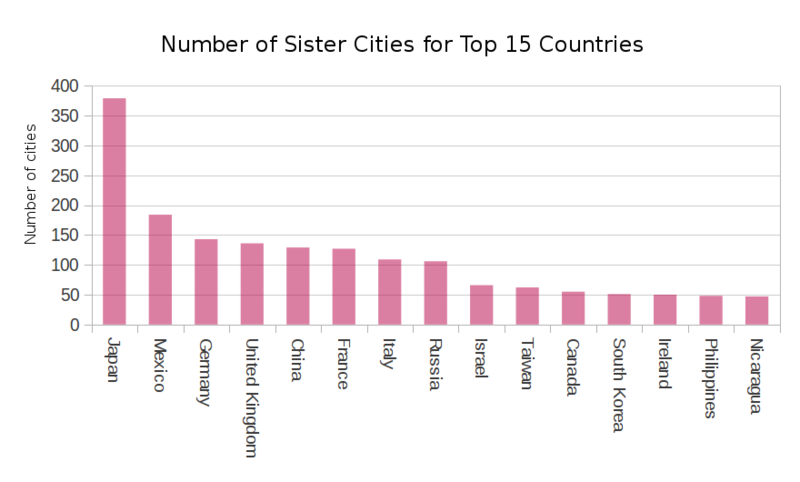 Further analysis might show an acceleration in sister city relationships in these rapidly developing, underrepresented countries; perhaps they simply need time to catch up, compared to the longstanding ties we’ve had with Western Europe and Japan. But will countries that are not modernizing so fast experience a similar acceleration in sisterhood? It seems unlikely. It is of course presumptuous to prescribe new local connections in the face of complex world politics. While our local communities would do well to link with towns in Egypt or Iraq, complications often don’t allow it; sister-city relationships require joint citizen advocacy, often including international travel, and of course political turmoil on a high level can affect these local ties. Still, bonds have been forged during wartime and through dysfunctional governments, and many healthy political relationships (such as between the US and Oman) still have not begat twin towns. It may be that, given time and a climate of relative stability, an increasing density of sister-city pairings will emerge between the US and the Middle East; after all, Vietnam now has several pairings, despite its lingering history of war. But recent unrest might make short-term relationships difficult to form. Our glance at the universe of US sister cities has revealed some fascinating insights and oversights, but we also envisioned an interactive tool that could both visualize the connections themselves and provide annotations or on-demand details for specific connections. The Faux-3D Arcs project contains a solid baseline for visualizing such relationships, and we have made sample pages for the data on all the cities , the Middle East , Japan , and low-income countries. These point to where such a project could go, balancing high-level understanding and an ability to hone in on individual connections. 3D-Arcs interactive display concept; sister cities in the Middle East. Sister city relationships have been used in wartime and peacetime to foster understanding between cultures, and a broad look at their distribution does tells a number of stories about geographical, cultural, and economic connections. While it is understandable that political and economic importance, responsible for shaping public perception, would shape the density of partner cities across the globe, it is clear that citizen diplomacy follows particular patterns of technology, access, and perhaps social cachet that are far from the idealized global picture of a network of relationships that bring harmony to citizens around the world. What do Mauritania and Mozambique, Burma and Bangladesh have in common? If the map of our sister cities is a map of our global connections, they have all been written off that map, overlooked by the current scope of citizen diplomacy. While the Sister Cities International website has an interactive directory , there was no single location that provided structured data regarding sister city relationships. Instead, we crawled Wikipedia's List of sister cities in the United States and its subpages, recording the name and location of the US city and its sister, as well as the Wikipedia URLs for each city, and the date of the pairing (when available). We then crawled each of the cities' pages for their coordinates. Using data from the World Bank website , we subsequently folded country population and GDP information into the dataset. 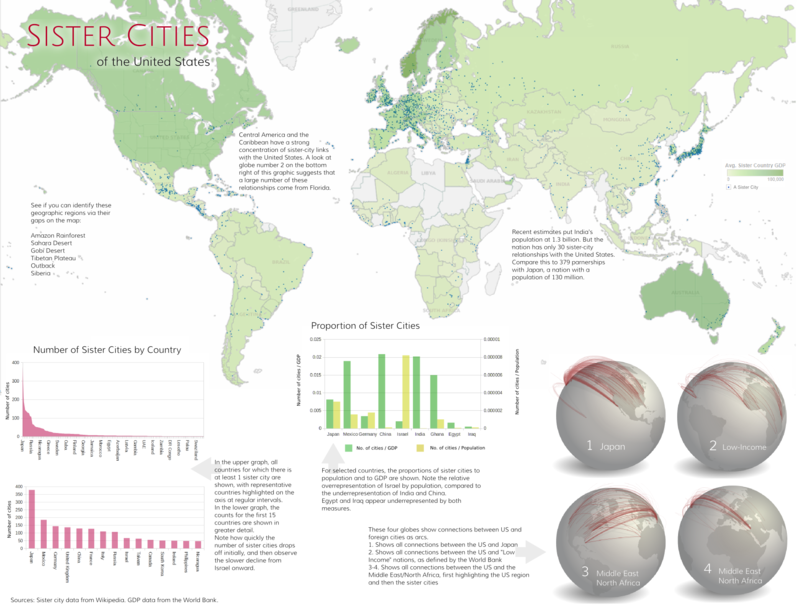 Our first step in querying the information was to visualize the global distribution of sister cities, which we did by plotting them onto a world map in Tableau with underlying GDP information. This allowed quick visual comparisons between a country's number of sister cities and its relative income level, which we treated as a proxy for importance or prestige on the world stage. We then highlighted and graphed population information for several countries we thought would be typical or atypical. We judged that our date information was too sparse to be applicable beyond qualitative comparisons and anecdotes; since we could find no centralized, comprehensive source for dates, we did not include a timeline. We decided that a partitioned poster would be the best method for presenting the data since it could provide an integrated set of different views, allowing broad geographical information to be supplemented by more focused charts, which we then created and combined. We also wanted an interactive view of the links between the cities, which would give a closer impression of the scale and demonstrate further possible avenues for visualizing sister cities. Borrowing source code from the Faux-3D Arcs project (based on the D3.js library), we modified the arc generation logic for our purposes and scripted the process of creating arcs with any subset of the data. Source data available as csv here. From wikipedia.org and data.worldbank.org.